The plants you know as pumpkins are cultivars of various squash species, mostly Cucurbita pepo, though plants referred to as pumpkins can also be part of other Cucurbita species. They are known for having large fruit with very thick orange or white rinds, which is the feature that makes them so suitable for carving Halloween Jack-o-lanterns. Like most squash species, pumpkins are very easy to grow from seed, but they do require a long growing season and thus are often started from seedlings purchased at a garden center. Pumpkins are virtually foolproof to plant—just plant two or three seeds about an inch deep in soil that has warmed to at least 70 degrees Fahrenheit. Pumpkins need 75 to one 100 days from planting to harvest, depending on the variety. Within five to 10 days, the seedlings will sprout and begin growing. Pumpkins germinate and sprout so readily, that many gardeners find that pumpkins randomly sprout up as volunteers each spring if any of the fruit was left to decay in the garden the previous autumn. To produce fruit, the flowers on pumpkin plants need to be pollinated. Normally, this service is provided by bees, butterflies, and other insect pollinators, but recent years has seen many regions suffer a serious decline in the populations of these pollinators. If you live in such a region, you can hand-pollinate by rubbing pollen from one flower to another. The flowers on pumpkins include both male and female flowers; pollination occurs when the pollen from male flowers reaches female flowers. As they grow, protect the pumpkins by carefully turning, which usually means flipping them from one side to the other without breaking the stem. This provides uniform sun exposure and helps ensure that the pumpkin doesn't flatten on one side. Some people put their pumpkins on a board, sheets of cardboard, or on a mesh to keep them from rotting. If your ground is wet for a prolonged period, this is probably a good idea. Even small pumpkins need lots of sunshine to develop. Make sure your pot is getting at least six hours of direct sun a day. One advantage of container gardening is that the pots can be shifted around to control the amount of light they receive. With pumpkins, more light is always better. As with any container gardening, make sure to use a high-quality, fast-draining potting soil in your containers. The more soil, the better. A good potting soil will retain water and pumpkins need a lot of water to support the fast growth of large vines and fruit. At the same time, it is important for the roots not to sit in standing water. Good drainage is important for pumpkins. Use either use a fabric pot like Smart Pots or make sure your pot has lots of holes (or one big hole that won't clog) so the water can drain out. Pumpkins need a lot of water. Your pumpkins will tell you when they are thirsty: Watch for leaves that begin to wilt and droop. Drench the soil thoroughly so that water runs out the holes in the bottom of the pot. A single heavy, saturating watering each day (or twice a day when the weather is very hot) is better than giving a plant tiny sips several times a day. Let the soil dry out to the touch before each heavy watering. Although pumpkins are associated with fall, they're a warm-season annual that require between 90 to 120 days free from frost to reach harvest and do best in 50 to 90 degree Fahrenheit weather. Sow the pumpkins in the spring two to three weeks after the last predicted frost date. The soil temperatures should have reached 65 degrees Fahrenheit, while the night air temperatures should be above 55 degrees. If frost threatens near the time of maturity, you can cover the plants on chilly nights to protect them. Mix a slow-release fertilizer in with the potting soil and then use a diluted liquid fertilizer every couple of weeks during the growing season. You can also sprinkle a dry, slow-release fertilizer onto the top of your soil during the growing season. However, be careful not to give pumpkins too much nitrogen after the flowers bloom because this will promote foliage at the expense of fruit production. Pumpkins do well with a nitrogen-heavy fertilizer when they are first growing and producing vines and leaves, but once flower production starts, phosphorus is the more important nutrient. Feeding pumpkins properly can be tricky. These plants need lots of food, but too much fertilizer can hinder flower and fruit production. It is best to back off the very heavy feeding once the pumpkin fruit is beginning to form, shifting to a diluted phosphorus-heavy fertilizer applied every couple of weeks. There are hundreds of types of pumpkins. Choose cultivars based on the size of your garden and the pumpkin's intended use. 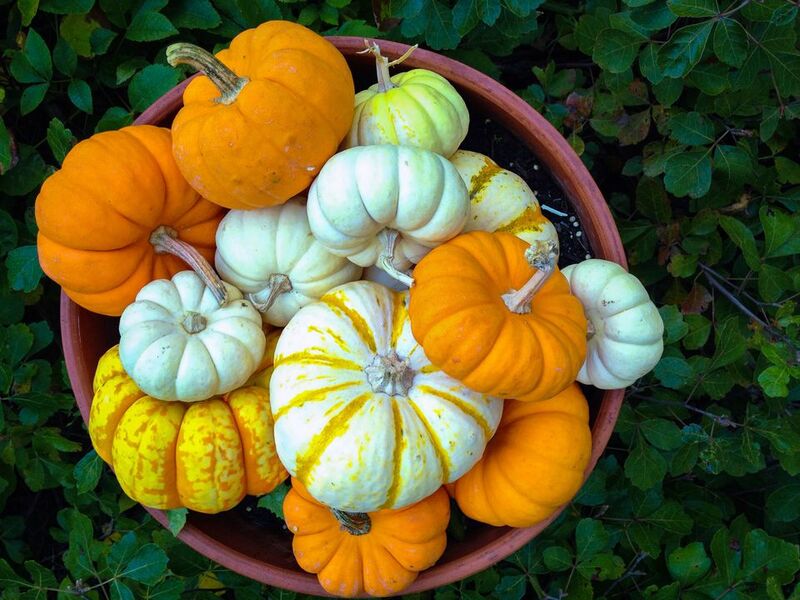 Small, decorative pumpkins: 'Jack Be Little' are miniature pumpkins that mature in 90 to 100 days. Other mini-pumpkins cultivars include 'We-B-Little' and 'Munchkin. Giant pumpkins: You might not be able to lift them, but you can grow giant pumpkins such as 'Dill's Atlantic Giant,' which can grow to 200 pounds. If large pumpkins for Halloween carving is the goal, pinch back all but two or three of the newly forming pumpkins as they appear. This will allow the plant to put its energy and nutrients in growing a few very large pumpkins. Pumpkins are ready to harvest when the rinds are bright orange (or solid white, on some types), and the skin is hard enough to withstand pressure from a fingernail without breaking. When you thump the rind with your knuckles, the pumpkin should sound a little hollow. Harvesting pumpkins can tricky because the thick stems can be very difficult to break. This is not a fruit that can simply be plucked. Use pruning shears to cut your pumpkin off the vine. Keep several inches of stem on the pumpkin by cutting as close to the vine as you can. After cutting the pumpkin off the vine, some people suggest curing it by leaving it in the sun for a week or so before bringing it indoors. However, watch for animal pests, as pumpkins are favorite of squirrels, rabbits, deer, and other creatures. Many great pumpkins are ruined when animals discover them. Pumpkin vines take up a lot of space in the garden as they creep and sprawl—the lengthening growth is visible on a daily basis. If you don't want to occupy huge amounts of space in a garden, pumpkins can be planted in containers or large pots, allowing the vines to creep along a deck, patio, or other surfaces. One advantage of container gardening is that because the soil in pots sits up in the sunshine, it warms faster than the earth as winter gives way to spring. This means that you can plant your pumpkin seeds a few weeks earlier than if you were planting in the ground. Pumpkins produce long masses of vines covered with thick leaves and very large fruit. This requires a container large enough to contain a large root ball and enough soil to provide the moisture necessary for the pumpkin plant to grow. Do not try growing pumpkins in a pot that is less than 10 gallons. If you want to grow more than one plant, then a container 15 to 20 gallons or bigger is even better. You might also have great success growing pumpkins in straw bale gardens—a style of gardening in which vegetables are planted directly into a bale of straw that gradually decomposes over the growing season. Pumpkin vines grow very quickly and some can grow to amazing lengths. Some people train them up trellises or pinch them back to keep the fruit production near the center of the plant. If growing your pumpkin plant on a trellis, you'll have to figure out a way to cradle the pumpkins so the weight does not break the vine. Some people use nylon stockings, pantyhose, or cloth bags suspended from the trellis to suspend the pumpkins. If growing climbing pumpkins, avoid varieties that produce very large fruit. Pumpkins are susceptible to a number of pests and diseases. Problematic pests include squash borers and cucumber beetles. To manage both types of pests, use floating row covers that are removed at bloom to allow bees to pollinate the plant. Diseases that might affect pumpkin growth include bacterial wilt, which is spread by cucumber beetles, as well as powdery mildew. However, there are disease-resistant varieties that will make gardening a lot easier. Managing the cucumber beetles will help prevent bacterial wilt, and allowing plants enough space for air circulation and sun exposure will help avoid powdery mildew.